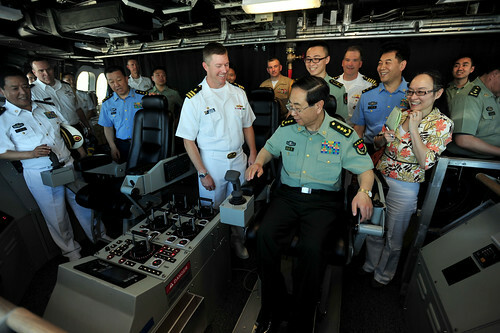 SAN DIEGO – Chief of the General Staff, People's Republic of China, Gen. Fang Fenghui arrived here, May 13, for a scheduled two-day visit hosted by Commander, U.S. 3rd Fleet (C3F) Vice Adm. Kenneth Floyd. During his visit to San Diego, Fang met with Adm. Samuel J. Locklear, commander, U.S. Pacific Command and received tours of the aircraft carrier USS Ronald Reagan (CVN 76), the littoral combat ship USS Coronado (LCS 4) and the U.S. Marine Corps Recruit Depot. Fang's visit to San Diego is part of a week-long engagement hosted by Chairman, Joint Chiefs of Staff, U.S. Army Gen. Martin Dempsey. This counterpart visit is intended to help establish clear paths of communication, encourage transparency and trust, mitigate risks, and focus multilateral cooperative efforts to address common regional and global security challenges. Fang is scheduled to visit Dempsey at the Pentagon Thursday followed by a visit to U.S. Army Forces Command in Ft. Bragg, North Carolina, before wrapping up his travel with planned meetings in New York. Joint interagency and international relationships strengthen C3F's ability to respond to crises and protect the collective maritime interests of the U.S. and its allies and partners.